Lyricist David Zippel gives new meaning to the term ""multi-task."" The Tony-winning and Oscar-nominated wordsmith is currently working on half a dozen stage and film musical projects with a veritable Mt. Rushmore of theatre talent, including Cy Coleman, Larry Gelbart, Alan Menken, Wendy Wasserstein and Matthew Wilder. Zippels lyrics for these projects and others are published through his ""In Your Ear Music"" catalogue, now administered exclusively by Williamson Music. ""We are thrilled to have David join our family,"" says Williamson President Maxyne Berman Lang. ""Though our company has deep roots in the classic popular music field, we are deeply committed to the future, and Davids future is especially exciting."" ""When we first discussed the idea of working together,"" recalls Zippel, ""it became instantly clear how right this is. Its about being in business with people who share your values, who you are proud to work with. I know that Maxyne and the Williamson staff are going to see the potential in what I do, and help me cultivate my career and represent my catalogue. Its a perfect fit."" Zippel, winner of the Tony Award for his lyrics to CITY OF ANGELS, and an Academy Award nominee for his songs in the Disney animated features HERCULES and MULAN, has achieved global success with an array of songs that have appeared on more than 25 million CDs, recorded by the likes of Stevie Wonder, Mel Torme, Ricky Martin, Barbara Cook and Christina Aguilera. It is quite a leap from Pennsylvania suburbia to the glitter of Tony medallions and platinum records; like the eponymous heroine of one of his new stage projects, PAMELAS FIRST MUSICAL, Zippels love for musical theatre and the craft of lyric writing began when he was very young. ""SOUTH PACIFIC,"" he says simply. ""I recall that score from my earliest memories. My parents had the album, and I used to play it relentlessly. The local community theatre was putting on a production and I got cast in the role of [de Becques little boy] Jerome. The production, ultimately, never happened, but I was undaunted; there was something about songs telling a story that clearly intrigued me. And I got to be a newsboy in GYPSY the following year!"" Trips to Broadway to see productions of OLIVER! (""I thought, Oh, all these kids are doing musicals. I can do that!"") and local summerstock productions of THE MUSIC MAN hooked him for life. By the time he was a teenager, Zippel was into Billy Joels PIANO MAN and Joni Mitchells COURT AND SPARK to be sure, but his turntable also spun cast albums for GYPSY, SHE LOVES ME, COMPANY and a few forgotten flops. ""I listened to theater a lot,"" he recalls. ""I used to buy cut-out records of shows that didnt make it, and study them Talmudically. You learn from both the good and the bad, and some of the failures taught me as much as the hits."" Subliminally perhaps, Zippel was giving himself a tutorial in lyric-writing. By the time he was in Junior High School, he was amusing himself and his friends by writing parody lyrics about their teachers, set to the Top 40 hits of the day. ""Today I would have to describe these songs as unrepeatable,"" he says, ""not to mention unprintable."" But these school yard sonnets bore two fundamental traits of a Zippel lyric: they were driven by humor, and shaped by character. As he began to write more in that vein, Zippel found himself appreciating the skill of Americas greatest musical theatre writers. ""By the time COMPANY came out, I really got the Sondheim bug. I would listen to everything he wrote, and anticipate every show he did. And I discovered obscure songs by Cole Porter and the Gershwins that blew me away. Larry Hart dazzled me with his wordplay, and Oscar Hammersteins songs were character studies unto themselves. ""Another Williamson writer whom I idolize is Sheldon Harnick. Take Dear Friend, from SHE LOVES ME, when Georg sings, When I meet my lady of the letters/Who puts tiny faces in her Os. How perfect is that? Every image is brilliant, and it says so much about both characters in that situation, it really is the creative peak. What floored me about the whole score for SHE LOVES ME, in fact, is that it is so honest and completely character-driven."" Looking back on that period of discovery, Zippel realizes that he gained insights then that are fundamental to his work today. ""Its why Sheldon Harnick is my hero,"" he says. ""I try to live up to what he does. If you want to write songs about characters, you want to be a musical dramatist. You want to create characters who speak and sing in the same voice; I want to know that my lyrics come out of the dialogue, come out of the situation. Its a constant goal for me -- it always has been."" David Zippel attended the University of Pennsylvania, followed by Harvard Law School. (Today, his official bio ends with the cheerful line, ""A graduate of Harvard Law School, he is delighted not to practice law."") A few years of toil in relative obscurity began to lead, step by step, to success. He wrote a few songs for Barbara Cook with her longtime accompanist, Wally Harper, including the tuneful ""Its Better with a Band"" (which later became the title song for a revue of Zippels work), contributed songs to a few Off-Broadway musical revues and along the way, he says, ""I began to be noticed."" The big break came with DEATH IS FOR SUCKERS, better known by the title it finally sported when it got to Broadway: CITY OF ANGELS. The composer was Cy Coleman, the books author was Larry Gelbart, and they took a chance on their novice lyricist. 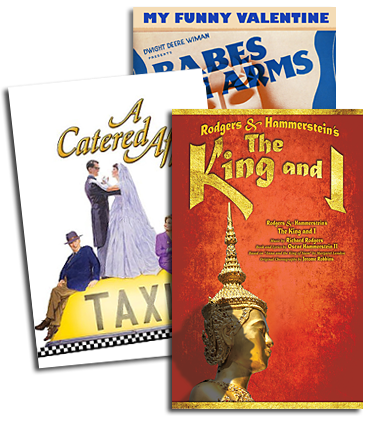 The gamble paid off: David Zippels first Broadway credit was a smash hit, winning the 1990 Tony Award for Best Musical, spawning a London production, a national tour, and numerous productions to date. And with it, David Zippel -- lyricist -- had arrived. The next stop was Hollywood; in the mid 90s, some of the best musicals around were being produced on the drawing boards of the film studios animation departments, and the gold standard was set by Disney. In 1997, Zippel joined eight time Academy Award winner Alan Menken to write the songs for HERCULES, which featured Michael Boltons #1 hit, ""Go the Distance,"" earning Zippel his first Academy Award nomination, and a Golden Globe nomination. The following year, Zippel collaborated with pop songwriter Matthew Wilder on another Disney animated feature, MULAN, earning him Oscar and Golden Globe nominations again. Within a few short years, his eclectic resume grew to include more animation projects, themes for TV shows, end-title cover songs for major motion pictures, and pop hits. PAMELAS FIRST MUSICAL, based on Wendy Wassersteins delightful book about the seminal moment in a lucky young persons life (book by Wasserstein, music by Coleman). PAMELAS FIRST MUSICAL features a Coleman-Zippel anthem, ""It Started with a Dream,"" that is also the title track of Colemans new album. The lyric, apt for the story line, is also deeply personal. After all, David Zippels life in the theatre started with a dream, too. A songbook anthology will be published shortly. For more on David Zippel, visit www.williamsonmusic.com.